Dorus, Monotype, 5 1/2 x 5 1/2 in. I have been framing work for the 2010 Vashon Island Holiday Art Studio Tour and decided to share another image that reflects the reoccurring theme of “Origins” in my recent work. Dorus, son of Hellen, (father of the primary tribes of Greece) is the mythical King and founder of the Dorians in the region of Mt. Parnassus, north of the Gulf of Corinth. Every student of architecture who read Sir Banister Fletcher’s History of Architecture will recall his descriptions of “temenos” or “sacred enclosure” and remember the comparative architectural evolution of Greek orders. The Doric Order and Column, named for Dorus was the the simplest and first of the orders, the archetype, the original. 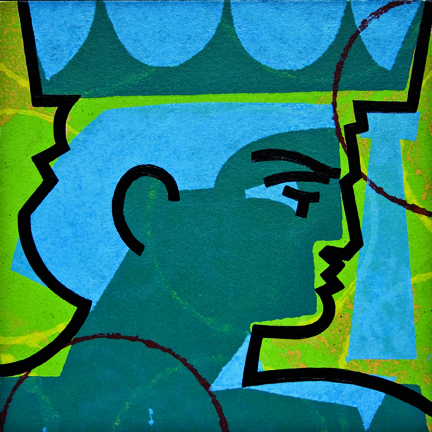 In my Monotype I have depicted Dorus’s crown or capital as a fluted section of column, another detail of the Doric order.